Intense Squatting Workout For Extreme Leg Size. Stop being the pansy that can't hold up their own with leg strength and size. Get big and be real right here with intense leg squats - try the workout I have included and see what you think! Unlike the more flashier upper body muscles - most notably chest and biceps - leg development is often neglected, much to the detriment of those seeking a balanced physique with high overall levels of body mass. Excuses for neglecting legs, which for the purposes of this article denote the quadriceps and hamstrings, are many: they are not as obvious as the more visible upper body muscles and therefore should not have any undue energy wasted on them, they get enough training during day to day activities, training them is too hard on the knees and bad on the back, working them too hard will stunt growth, and the single biggest, although seldom mentioned reason: training them requires too much effort. It is correct that the legs are a very hard group of muscles to train, as the sheer volume of work required to adequately simulate them, and the fact they burn like no other muscle group when subjected to heavy workloads, causes intense pain when they are worked properly. The trade off is well worth it though. Firstly, the legs, when developed to their full potential, are a most visually impressive group of muscles - in fact, the overall symmetry of the body relies on total leg development to properly balance the physique. 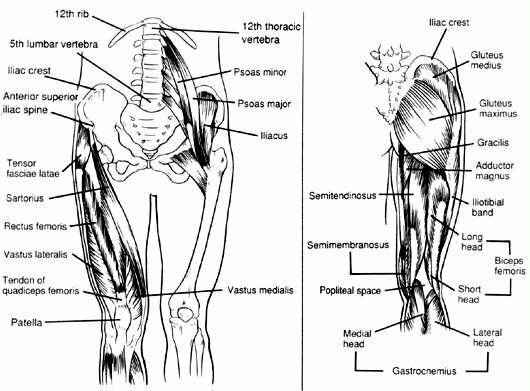 Secondly, along with the gluteus maximus, the legs comprise the strongest section of the body, and their strength is needed for a variety of activities and sports. Finally, and perhaps most importantly for bodybuilders, the work required to develop them fully, actually stimulates the entire musculature, causing the whole body to grow. It could be said that failure to develop the legs equates to neglecting growth throughout the entire physique. One leg exercise responsible for the development of more lower body mass than any other is the squat. The squat, widely proclaimed as the most valuable exercise in existence, also works to a large degree, the lower back, and pelvic and abdominal region (collectively known as the core). HAIL TO THE KING - The Number One Monster Maker! Just one set of this exercise will make you turn from a mere mortal with chicken arms into a fully fledged monster, teaming with muscle. Learn the truth about the squat right here! Most sports require a strong core region, making the squat a valuable addition to many athletes training programs. As a muscle-builder, squats - both the standard version and its variations - are unsurpassed for building leg size from all angles, and for working the physique systemically. Squats work all the muscles of the quadriceps (the rectus femoris - middle head- vastus lateralis - outer head - and vastus medialis - inner head) and hamstrings (the biceps femoris - outer head - semimembranosus - middle head - and semitendinosus - inner head), along with hip flexors and abductor (on the outer thighs) and adductors (on the inner thighs). The benefits of squatting do not end there. In addition to at least 75 percent of the body&apos;s muscle (primary ones being the shoulders, back, trapezius, gluteus maximus, and calves along with the thighs and hamstrings) being worked through the squat, it is the most physically demanding of the various weight training exercises, so will therefore enhance cardiovascular health and endurance levels. The squat, due to its intense nature, will also stimulate the metabolism greater than any other movement, which will assist with fat burning, both during the exercise itself and at rest. Also, of special interest to bodybuilders, and due to its degree of difficulty and strenuousness, is its ability to release higher amounts of growth hormone, which will contribute greater overall gains in muscle size and strength. Lastly, the squat has been shown to enhance strength in all other lifts due to its ability to work a greater range of muscles, thus adding to its reputation as a total body developer. Which Benefit Of Squatting Do You Find Most Important? Working Of Quads And Hamstrings. Working 75% Of All Major Muscles. 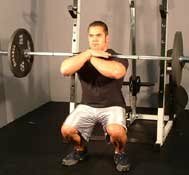 Given all the benefits of squatting and its ability to target all the muscles of the legs in the most efficient and effective manner, the workout featured in this article will be comprised of three variations of this great exercise, all designed to build total leg mass, while focusing on separate areas of thigh/hamstring grouping. Great quadriceps and hamstring development requires mass and shape, and separations between all of the thigh and hamstrings muscles. The squat, if done effectively, and through the use of its variations, will develop all of these muscles to their fullest. The exercises and training protocols outlined in this article are intended to help both the beginner and advanced bodybuilder add as much balanced muscle mass as is humanly possible to their legs (all areas of the quadriceps, and hamstrings). Let&apos;s get to work. Hailed as the king of all bodybuilding exercises, the front squat is known to add more total body mass than any other movement. As a leg mass-builder it is unparalleled, so should form a major part of any bodybuilders training arsenal. 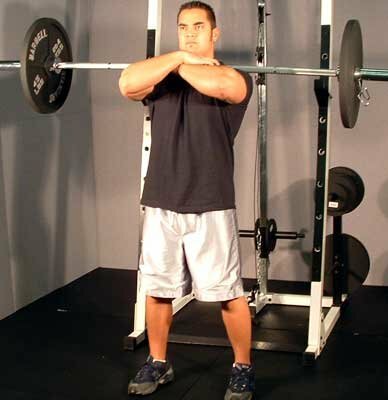 Position bar in squat rack about three inches below the upper shoulder area. Place hands evenly spaced on the bar, and place bar comfortably across trapezius area. Push weight up using legs, not back. Place legs at slightly wider the shoulder width with toes pointed sightly outward. Keep head up and chest out. Slowly bend knees while keeping hips under the bar and torso erect (do not bend the back). Fully descend into a deep squat, while controlling the weight and keeping tension on the leg muscles. At bottom of movement, push bar up with feet and hips while breathing out forcefully. End at lockout and repeat (a non-lockout position can be used for one set of this exercise per workout). Excellent for developing the vastus medialis (teardrop muscle at lower, inner thigh), the front squat is generally done with a lighter load and a higher number of repetitions, with partial reps and an narrower stance, as a way in which to focus stress on the lower quadriceps and outer sweep, while de-emphasising upper thigh involvement. A particular focus should be placed on the lower part of the movement; a complete descent should take place before the weight is lifted to just short of lockout. To keep continuous tension on the vastus medialis, I prefer, given isolation of this muscle is the aim, that a full lockout be avoided. Place racked barbell across upper chest and position on the front of the shoulders. Next, place hands on top of bar, with arms crossed (can also be pointed out) and parallel to the floor (ideally the hands shouldn&apos;t hold the weight, rather it should be supported by the shoulders and collarbone). Place feet at shoulder width and point toes out. End just short of lockout, and repeat. Wide stance squats are a great variation on the standard squat as they place the majority of stress on a different set of muscles, while allowing for greater loads to be lifted. Sometimes referred to as the power-lifting squat as it is the squatting style typically used by competitive power-lifters (it prevents the athlete from going too far below parallel while placing the emphasis on the posterior chain - the hips, hamstrings and glutes), the wide stance variation is an excellent way to generate maximal power throughout the movement to attack deeper muscle fibres. While standard and front squats primarily work the frontal quads and legs as a whole, the wide stance movement helps to build tremendous hamstrings and glutes, while also stressing the inner thigh to create greater thickness in this region. This movement combined with the previous two exercises will help to build total leg size. Place hands evenly spaced on the bar and place bar comfortably across lower trapezius area. Place feet wide apart and point toes outward. Sit into position by pushing back with the glutes. Descend just below parallel, while controlling the weight and keeping tension on the leg muscles. With both workouts the quadriceps and hamstrings are training separate to calves and tibialis for the express purpose of placing every ounce of energy into their development. Calves and tibialis can be training on their own on a separate day, or with another body part at ones convenience. The workouts both beginner/intermediate and advanced) can be done for ten consecutive weeks, for the purposes of building additional mass, before resuming with ones normal leg routine (an unloading phase to prepare for subsequent squat workouts). The amount of weight lifted depends on ones individual strength levels. Typically greater loads can be lifted for the wide stance squat, while lighter weights can be used during front squats. As with the advanced lifter, the beginner or intermediate athlete (typically those with eight to 12 months lifting experience) can train legs twice a week without fear of over training. Given the legs are a large muscle group that requires additional work compared to smaller body parts, it can be trained with a greater overall workload. Also, the legs are stimulated to a large extent every day, as they support our bodyweight whenever we walk, run, jump, stand and sit. They therefore need greater workloads to be stimulated sufficiently to grow. Although the beginner will train legs twice a week, the overall workload will be less compared to the advanced lifter, as the body requires a period to adjust to the high intensity nature of such a workout. For both beginner/intermediate and advanced all weight is to be adjusted according to rep range. First set: 10 to 15 repetitions (warm up set to non-lockout position). Second set: eight to 12 repetitions. Third set: eight to 12 repetitions. All three sets: 10 to 15 repetitions. First set: eight to 12 repetitions. Second set: six to eight repetitions. Third set: six to eight repetitions. Click Here For A Printable Log Of Day One. First set: 15 to 20 repetitions (warm up set to non-lockout position). Second set: 10 to 15 repetitions. Third set: 10 to 15 repetitions. Click Here For A Printable Log Of Day Two. Although the advanced workload may seem excessive to some, I personally have found this routine to be very effective. The variation in rep ranges combined with the high workload divided into two workouts (providing for sufficient rest between sessions) will literally force the legs to grow. If one can push through the pain barrier, especially on the high rep days, a massive set of well-defined legs will be the reward. First set: eight to 12 repetitions (warm up set to non-lockout position). Fourth set: four to six repetitions. First set: 10 to 15 repetitions. Fourth set: six to eight repetitions. First set: 15 to 25 repetitions (warm up set to non-lockout position). Second set: 15 to 20 repetitions. Third set: 15 to 20 repetitions. Fourth set: 15 to 20 repetitions. Exercise Two: Front Squats (All Sets To Non-Lockout Position). Fourth set: 10 to 15 repetitions. Although it is advised to achieve a full range of motion during the majority of sets prescribed in this article (for a maximal contraction), it is also good practice to avoid lockout on one standard squats set, and for all sets of front squats. Avoiding lockout requires returning to a point just below full extension, with a view to keeping tension on the muscles being worked. Avoiding lockout will assist with the development of the vastus medialis, or teardrop muscle, and allow for a greater burn overall, which will contribute to more complete leg development. However, given the amount of weight lifted during the standard squat, for safety, and recovery purposes, it is probably best to limit non-lockout reps to lighter sets of this movement and the front squat, which involves using a lighter weight while emphasising the lower part of the rep.
2. Vary The Rep Range. Varying the number of repetitions both within the workout, and from session to session, will better stimulate a greater number of both fast twitch (power) and slow twitch (endurance) muscle fibres. Given the legs are comprised of both fibre types, each responsible for the overall performance, and size potential of the individual muscles of the legs, it is important to target each with specific rep ranges. Also, varying rep ranges will ensure the legs are constantly stimulated in a different manner, thus providing the anabolic conditions necessary for continued growth. High repetition days will really carve in the definition and create the separation necessary for the balance and detail needed for a more complete set of legs. Lower reps will add the mass that will form the basis, and overall shape of the quads and hams. With the workouts featured in this article, weight is to be adjusted depending on the number of repetitions prescribed. For example, a higher number of reps would require a lighter weight. This is pretty self-evident but some lifters, beginners especially, may try to use the same poundage for every rep range, which could lead to injury. 3. Avoid Any Aerobic Work At Least 24 Hours Before Leg Training. To successfully complete both beginner/intermediate and advanced workouts featured in this article, it is important the legs are both fully rested and at optimal strength before each workout. This means the muscles to be worked must be sufficiently recovered and their glycogen stores are to be full. Aerobic work done in the 24 hours before leg training is thought to interfere with recovery of the legs as well as the depleting of their glycogen stores. Although glycogen can be replaced, and aerobic training burns primarily fat, cardio will tap into some glycogen, and can make enough of a difference to warrant excluding it the day before leg training. Try this strategy and you will see it really makes a difference. As a side note, bodybuilding great Tom Platz always believed in avoiding any form of cardio 24 hours before leg training and he is thought to have the biggest legs of all time. Although the squat is, if performed correctly, one of the safest of resistance training exercises, injuries can occur if steps aren&apos;t taken to ensure perfect form. Varying foot placement, which is done with all three variations in this program, is a great way to lessen the stress placed on the knee joint. Wide stance squats are a good way to take stress from the posterior cruciate ligament (PCL), a common site for knee injuries, while a narrow stance can increase stress within this area. 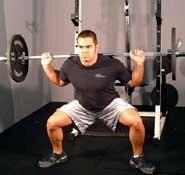 Overall, however, the squat is very safe and, if the guidelines in this article are followed, should not cause injury. It is worth remembering that 75 percent of all squatting injuries occur before and after the actual movement itself (moving into position or returning the bar to the rack), so concentration during the movement in its entirety is important. Another way to avoid injury is to begin the squat at the hips, rather than the knees. So don&apos;t let the "Dangerous exercise excuse" prevent you from doing them. Squatting deep is important to achieving full leg development. However, this should not be at the expense of form, so keep the technique strict while aiming to increase range of motion from workout to workout. Go Deep On Your Squats. To enhance the effectiveness of the workouts provided in this article it is important to stretch the thigh and hamstring muscles between each exercise. Doing so will help squatting performance significantly. A lack of flexibility, or general tightness in the quads, hamstrings and calves can promote a lack of depth during the squat, rounded back, and rising heels during the descending aspect of the lift respectively. 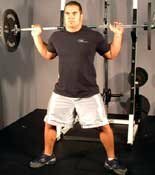 Give the complexity of the squat (and the large number of muscles which require coordinating) attaining perfect technique can be difficult. Stretching will help one to squat more easily, effectively and correctly. Stretching between exercises will also help to loosen the fascial layer of tissue situated between the skin and muscle to promote greater growth. Bend forward from the hips with one leg extended, while keeping an arch in the lower back (ensure stretch is done bending from the hips, not the waist). One of the better stretches for developing squatting technique while targeting the specific muscles used in this exercise is the squatting stretch. To perform simple lower body into squatting position, and ease into a stretch. Remain in this position for five to ten seconds. Place hands against a wall. Slide one foot back, while pressing heel down. Bend knee and, hold stretch for a further 20 seconds (the bent knee position will target the calves soleus muscle). Before attempting any of these workouts warm-up with three to five minutes on the stationary bike and stretch for five minutes. Warming the muscle will prepare the legs for the work to come and help to prevent injury. Developing great legs requires a tremendous amount of focus and total commitment, such is the intensity needed to fully target this large, stubborn body part. The level of size, shape and separation the quads and hamstrings possess determines great leg development, and a failure to include a specific strategy that targets all these criteria in ones program will result in sub-optimal progress. The workouts provided in this article - centered on the number one leg exercise in existence, the squat - will push your leg development to new levels of size and shape if followed consistently. National Strength and Conditioning Association. (2004). The Squat Exercise in Athletic Conditioning, NSCA Position Statements.